Three new books in the LuEsther T. Mertz Library will inspire readers to embrace desert landscapes and plants. 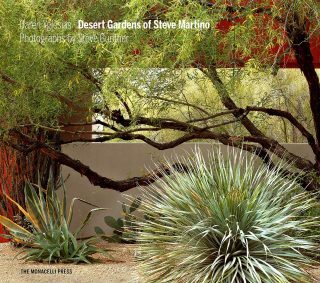 Desert Gardens of Steve Martino (2018) is a lavish ode to the landscapes of the landscape designer Steve Martino. Authored by Caren Yglesias, a licensed architect and lecturer in landscape architecture and environmental planning at UC Berkeley, with photographs by Steve Gunther, the book is well-designed and executed. Because of their artistic nature, some of the photo-documentation abstracts the designs of the gardens; it is helpful that each garden includes a site plan that illustrates the layout of the site in more measured detail. Twenty-one of Martino’s gardens in the American southwest are treated. Martino, who focuses on using plants that are native to the Sonoran region, creates gardens that are evocative of the desert from which they spring. East coast gardeners and designers may not look to Martino for practical landscape design inspiration, owing to the differences in climates. However, his use of structure and color can be universally enjoyed by those who create, maintain, and appreciate garden landscapes. 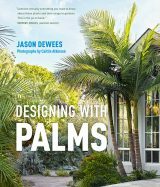 In Designing with Palms (2018), author Jason Dewees, staff horticulturist at Flora Grubb Gardens and East West Trees in San Francisco, has created a beautiful and informative book for gardeners and landscape designers who would like utilize more members of this versatile plant family. Beautifully designed with lovely photos by Caitlin Atkinson, the content is well-researched and includes appropriate suggestions for gardeners in a variety of climates using the Köppen climate classification. The book includes an introduction to the palm family, Arecaceae; “palm sensations and services;” “the stories palms tell” (or how to use palms in landscape design); an overview of important American gardens that heavily feature palms; and a portfolio of palm species. All in all, it is a beautiful work and a great reference for gardeners and designers alike. 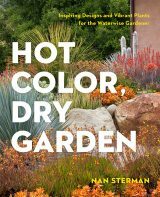 Hot Color, Dry Garden: Inspiring Designs and Vibrant Plants for the Waterwise Gardener (2018) seeks to offer inspiration to those who worry that planting drought-tolerant native plants has to be monochromatic or boring. Author Nan Sterman, who holds degrees in botany, biology, and education, has compiled a visually-appealing compendium of resources meant to inspire gardeners to think differently about color, contrast, and texture in water-wise gardens. The book has two primary sections—the “garden gallery” filled with landscape shots of water-wise (predominantly desert) gardens, and the “plant directory” of suggested candidates for home gardens, including (importantly) cold tolerance. Although this book is most appropriate for gardeners in a desert climate, the garden’s features may inspire gardeners in other regions. Ultimately, Hot Color, Dry Garden is a fun and vibrant book.